(CHRIS) The 6th of July broke clear and crisp over South Dakota. Jon got up early and made some phone calls. Sam and I ate canned fruit while Matt wandered Spearfish aimlessly looking for Jon. Finally we regrouped at about 9:30am and drove into Black Hills National Forest. (Fun Fact: A young spruce tree, common to this area, has black bark--thus the name.) We drove through the forest. It was very nice, but, after all we have seen, not really impressive. We stopped at Roughlock Falls. It was pretty nice. We washed our stinking feet (Days Since Last Shower: 9) in the freezing creek (cold feet for ya! We no feel 'em no more!) The drive to Keylock was nice, but the flow of tourists became very thick. Why? Because this is the home of Mount Rushmore! But first we went to see another mountain carving in the making... Crazy Horse. Someday it may rival Mount Rushmore, but it's no biggie yet, All it has is a bit of his face and an outline of his horse's head. They charged $15 to get in there, but you could see it from the road. We drove through anyway, telling the girl at the gate that we were just turning around. So we got a quick look at it. Mount Rushmore was packed with tourists, but the view was incredible. We learned how it was made from a ranger in the museum. Mt. 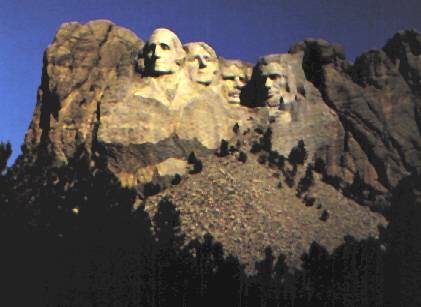 Rushmore Fun Facts: It was made from 1927-41, cost just under $1 million, and will erode less than 1 inch every 100,000 years. We were getting hungry now, so we looked for a picnic table. We finally found one, but it had a sign, "Picnic $2." That was a new idea, but we decided not to go for it. There are some new things we don't try. It started to rain so we ate on the road. Guess what it was? PB&J! Well at least there were no beans. We stopped in Wall, SD, home of Wall Drug. There were signs for this tourist trap for 80 or 90 miles so we felt we had to stop. Oh, just before that we stopped and bought $30 worth of fireworks. Wall Drug was cool. There were tons of gift shops and moving cowboy displays. Sam especially liked the Tumbling Tumbleweed Cowboys and Sam the Singing Gorilla. Just before leaving, we noticed 2 girls about our age. I thought they looked a bit too feminist, but Matt thought the one with sort hair was pretty. We'll call them the Peaches for now. Matt got a free Wall Drug bumpersticker and put it on the van. 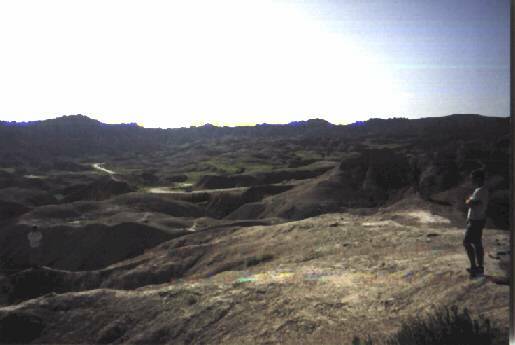 Then we headed for Badlands National Park. As we neared the park, Sam was anxious to light a firecracker and throw it out the window. But some one was behind us. It was the Peaches! They had an extra antenna, so we tried calling them on the CB to ask if we could light a firecracker, but no dice. At the park entrance, we got a bit ahead of them and were able to light one. Bam! Wow, fun. We stopped at the 1st scenic view and they pulled up behind us. Before taking off, we checked their plates--Georgia--Hmmm. We stopped again to climb some of the formations and they drove past. 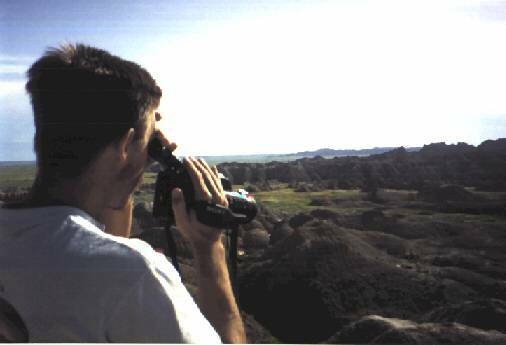 As we drove through the Badlands, we stopped at most of the viewpoints and climbed out past the railings, the envy of all the other boring tourists. The park was truly cool. 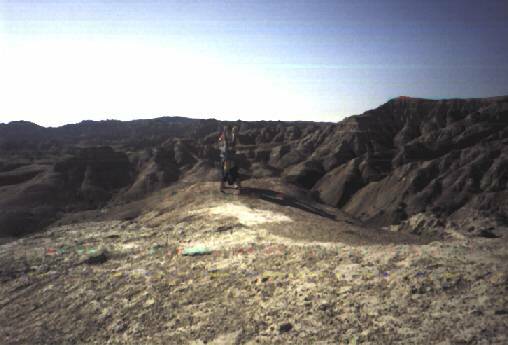 It was all big dried mud formations. And the weather was nice finally! We even saw fossils of extinct ancestors at one stop. Billions and billions... As we drove, Jon and Sam lit a firecracker but didn't get it out the window in time. It blew up in Jon's hand, but no damage except ringing ears! Sam's rang until he slept. We got to the campground, the only one in the park, at about 6, We saw the peaches checking us out as we searched for a site. We got the last one--a handicapped site! Wow, I never knew they made them. There were no trees here of course. It was all prairie, so the ground was soft. We began to cook dinner after putting up the tent (without rain flap--it looked like it would stay clear!) our food supply was very low, so we had to make a concoction soup to eat. We like to call it shrapnel soup. It's contents: 2 cans vegetable soup, 1can pork and beans, 2 packs Ramen noodles, 1 can tomatoes and peppers, and of course Tony's (and Manwich sauce). It was pretty good. A peach walked by when cooking. Sam said she was a "wolfer." After eating, we went to the visitor center. Matt and Jon called their women while Sam and I saw the cool "hands on" Museum and intro video. We learned that "the weather changes fast" here. Hmmm--foreshadowing perhaps! Then we climbed some of the bigger formations. This was the only park we'd been to that said, "Make your own trail," instead of "Stay on the trail." Sam and I climbed one huge thing, always precariously close to a fall on the crumbly substance. We found an old canteen, a bird skeleton, some tumbleweeds, and a dollar bill. Matt and Jon yelled to us from across the plain. Amazing sound conduction from mount to mount! It was still warm and clear as it started to get dark. I called home as the boys went to the amphitheater for a slide show. While talking I heard thunder, so I took off to put up the rain flap. The other 3 came running to help. It went up easily as it started to drizzle. We weren't worried; we had stayed totally dry in a Grand Teton thunder storm a few days before. We were used to rain--right? Wrong! Badlands suddenly seemed a very appropriate name. This all happened fast, faster than it sounds written down, so try to keep up. Anyway--then came this huge, hard, fast wind. All at once the dried fruit, the cards, the poker chips, the cups were flying off the table. As the wind got stronger and wetter, Matt came running back. The three of us were so preoccupied with the mess around the picnic table, that we did not notice the tent until Matt arrived and pointed it out. One deck of cards was mostly gone and as we rushed over to save out tent, I distinctly remember Jon with 8 or 9 cards saying, "Look Chris," with a gleam in his eye as he flung them into the wind. The tent was leaning all the way over and we could not put it up straight. The wind was pushing even us to the side. So we knew we had to get it in the car before it got blown away or destroyed. As we tried to unhook the rain flap, which was being held on tight by the wind, we saw a huge box tent go flying by. It went tumbling across the field, bouncing and flying. When it got to a nearby RV, it just floated up and over it and kept going. It was a sight I'll never forget. Finally, we got the rain flap off and into the car. No)w the rain was coming down really hard. I mean it hurt when it hit your bare skin. The tent was all squashed down on one side and it was full of all our sleeping bags, pillows, and foam mattresses. We madly pulled out the stakes and put the whole bundle in a kind of big wad and all four of us carried it the ten feet to the van (lucky we had a handicap site) and crammed it in the side door. The picnic table still had the stove on it, still hot from Jon's attempt to make hot chocolate. As I heard the stove crash to the ground, Jon stood perfectly calm in the wind and pelting rain, holding a big pot and said, "Where can I put this hot water?" I yelled at him, "Who the hell needs more water? Throw it out!" Finally we got everything and everybody in the van. Unfortunately, the hot stove was set down right on the tent--another hole! So there we were, all crammed in the van with a huge, wet glob that used to be my tent. Next followed a real quick debate. Matt wanted to fix the tent in the car, but I said that since we were already soaked but all our stuff was safe, we should go help out other people. I guess I convinced Matt and Jon because the next thing I knew the three of us were running through the rain to a nearby tent; we slammed the car doors behind us, cutting off Sam's argument, "I don't know if that's such a good i... (Slam!)" We helped 2 groups get their water logged tents in the car, then looked around for other helpless campers when Matt said, "Those girls!" And he was off and running. I was second, trying to see as the rain pelted my eyes amidst pitch black and then bright lightning flashes. Jon was behind me mumbling something about how dangerous it was to run in a lightning storm. We found the peaches trying to fold their mess of a tent and cram it in their little Toyota. There was no way it would fit in its tangled state. Matt, thinking, quickly, helped them carry it to the nearby bathroom. There, in the Cedar Crest Campground ladies bathroom, we finally talked to a girl! But introductions would come later. There was still alot to do. There was a bewildered old German couple in the restroom, who, if they ever spoke much English, had lost it in the storm. Finally the lady communicated that they came back from the amphitheater in the rain and their tent and car were gone. The peaches calmed them a bit and then went out to find that they had gone to the wrong side of the campground and that even their tent was still intact. Somewhere in there, I returned to Sam, who still needed the car keys to get the tent to the bathroom as planned. But since the peaches' tent was now taking up the whole floor, we decided to do more rescues. (MATT) Meanwhile, Jon and I stayed in the girls bathroom to "help" roll up their stuff and to make room for ours because we thought we'd bring the tent in there to fix it. (CHRIS) I ended up helping 2 girls from Ontario put their tent in the car, while Sam ended up taking down a tent with four other people, only to discover that none of them owned the tent. When they had it down, the owner popped out of his car, grabbed the tent, and got back in his car. The other helpers tent was entirely gone, blown away, sleeping bags and all. They said it fit the Description of the one 1 saw fly over the RV. We told a few of the campers, including the peaches, that their best bet was to go up the road to the visitor center where there was an enclosed porch. We met a ranger there. He said we could sleep on that porch (where they showed the intro video), but we had to be gone by 7am. Finally, we introduced ourselves to the peaches. Lisa (pronounced Lissa) and Lisa (pronouced Lee-sa). They thanked us profusely and gave us each a beer. Then they changed clothes in the van, then we changed clothes. (MATT) The ranger (a male) allowed us to stay primarily because the peaches were there, looking very pretty and bewildered. So that helped us out. The peaches told us that their guardian angels had been looking out for them--so we knew they were good girls and safe to talk to. THE PEACHES-, Lisa White: 23, short hair, "Lissa" and Lisa Carrio (25). Atlanta, GA primary school teachers, 1st and 2nd grade. Sally and Josie were fake names to guys they don't trust--not us. (CHRIS) There were already two people sleeping here, but the six of us chatted for awhile. Another nerdy ranger came and listened to us awhile, then left. We chatted for an hour or two and a few people came and went, looking for a hotel. Then this surfer-looking dude showed up, but he was from Buffalo, NY. He and his friend decided to sleep here too. Sam didn't like him, but couldn't decide if he was queer or just weird. Well, the new company kind of killed the conversation, so Sam, Jon, and I hit the cement and slept. Matt stayed up another couple hours (til 2:30) talking to Lisa and Lisa. They were really nice. They were school teachers, 23 and 25 years old, and were just starting a six week tour of the U.S. very similar to ours. (MATT) Those girls were brave--especially Lissa, who basically dragged Lisa along with her. I told them I was an ax-wielding maniac, but they didn't buy it. We took a long walk in the moonlight, but they were good girls so I was safe. Besides, if I can deal with homosexuals in L.A. in bathrooms I have no worries when with females.